The free-standing sculptures and “hybrid” paintings/wall-sculptures by Dionisios Fragias often place a contemporary spin on imagery derived from the Bible, ancient Greco-Roman myths, and current societal ritual utilizing the lessons they teach to comment upon mankind’s cyclical and competing tendencies toward creation and destruction. His work focuses on a specific area of man’s duality – the propensity to take action and dominate when he senses a void in any sphere of society. Whether the vacuum to be filled allows for the furtherance of a cultural, scientific and political agenda, or the gap being occupied permits exploitative and abusive uses of power, Dionisios suggestively presents both sides of the same coin. 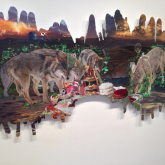 Fragias compares and contrasts the visceral human compulsion to assume control of nature’s own inner workings. The work traces and relates this need for urgent action with the way nature’s phenomena occur even down to the level of sub-atomic physics. Other examples include: A high-pressure system in climate will move its air toward a low one creating wind. Water will flow to fill an opening in the earth. A beta animal will rush in to kill a wounded alpha male and take over leadership (something occurring in large scale with certain regimes in parts of the world). 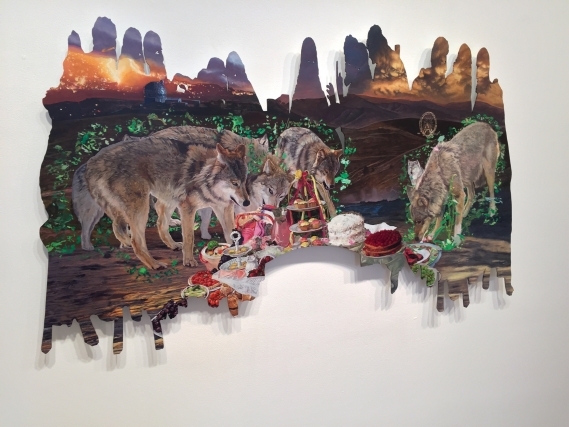 In the “hybrid” painting/wall-sculpture titled The Mystical Supper an oil rendering of a pack of wolves swarming a picnic spread left unattended by humans is superimposed over a distorted aluminium silhouette of Da Vinci’s The Last Supper. The After-party (Octopus) is a chaotic, free-standing sculpture that compares and contemplates one of nature’s most extreme forces- the tornado and several human and animal processions that are joined together in a stream-of-consciousness effort to form a stylized octopus. The tornado and its flying debris form the head and main body and the rows of people and animals mysteriously walking into the tornado from multiple angles form the tentacles. Minotaur Bouquet 2014, is a double hybrid. A stream-of-consciousness, plant-animal, abomination. It combines an unspeakably terrifying crossbreed, the Minotaur, with a delightful poly-flowered bouquet. One typifies energy and motion and the other is static beauty. In the painting element of the work a ghostly image of a man’s torso can be seen along with a contemporary metal armature that binds the whole work together. Plant and animal, human and metal structure make all the body-parts of a creature that is part living part machine. Much like the classical hybrids that were often born out of unholy unions, this amalgam hints of man’s desperate quest for knowledge and the unsavory steps that are sometimes taken in the name of progress.